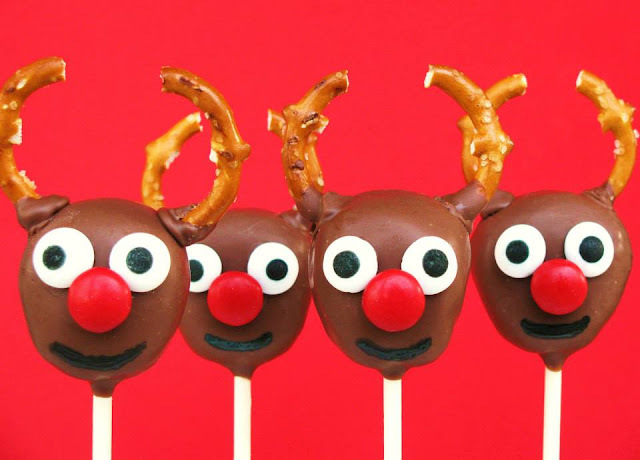 On Dasher, on Dancer, you know the song, now we have all of the reindeer in a cake pop. These cake pops are sure to please the kids and adults at your holiday party or gathering. .
Lay out a couple of ungreased pans, set aside. Cover a large piece of Styrofoam with foil, set aside. Prepare and bake cake according to package directions. Remove from oven and let cool completely. Break apart cake and place in a large bowl, then crumble completely. Stir in frosting, then blend together with hands until you have the texture of play-doh. Melt a small amount of vanilla candy wafers in a small bowl, set aside. Roll cake into an oval shape. Dip tip of lollipop stick into melted candy, then insert a little ways into the ball. Lay flat on pan. Repeat until all dough is used. *You will need to melt your vanilla candy wafers every so often to continue use. Place in fridge for 1 hour. While cake balls are chilling, break pretzels into 2cm sections, set aside. Just before removing from fridge, melt 1 bag of milk chocolate candy wafers along with 3 tablespoons vegetable oil in a double boiler. Remove 5 cake pops at a time from the fridge. Carefully, remove from pan and dip most of cake pop in the melted candy. Use a spoon to drizzle the candy coating near the stick. Tap cake pop on the side of the pan so excess will drip off, then use your finger to smooth out the back. Place in styrofoam. Melt candy wafers as needed to continue use. Pour leftover melted candy in a bowl and save. Let cake pops sit for several hours to set. Reheat leftover hardened candy in bowl and use to seal any cracks in coating with the tip of your finger. Place back in styrofoam to harden. Melt leftover candy, then dip one end of the pretzels in it. Place on each side of the head making sure to hold for a few seconds until set. Dab a small amount of melted candy on back of eyeball sprinkles, then place on face and hold for a few seconds. Dab a small amount of melted candy on back of red M&M’s and place on face for a nose holding for a few seconds. Using a thin paint brush, dip in black food coloring, then paint a mouth. Let sit for a few hours. Place a treat bag over each cake pop and tie with ribbon. OMG! These are absolutely adorable! I wish I had the skill to make these! I know I cannot make these, but they are cute. I love these - easy to make! It would be fun to make these with our grand daughters. These are so cute! I think I could make them, probably not as cute as yours turned out, but still would be really fun. 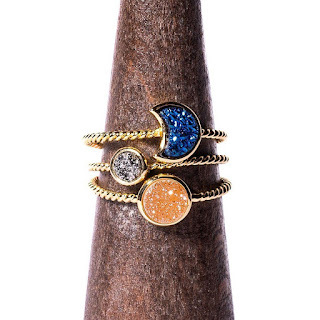 These are so precious and just perfect for Christmas! Thanks for the recipe. These are so cute! My grandsons will love helping make them and eating them! oh my gosh! These are adorable!! Perfect for the kids school parties! OMG!!! These are adorable. Thank you for sharing! These will be fun to make with my granddaughter over her holiday break, thanks for sharing! They are absolutely adorable and you make them look so easy! Ha! I like the pretzel antlers. I have never tried cakepops always figured they would be a gloppy mess and we would just eat the batter. These are so adorable I might give it a go! These are so cute. My kids would love to help make these! I love these. My daughter will be so happy if i make these. Love them! They would be great for a school party snack or family get together. Very cute! These reindeer cake pops are adorable! I love them. I know my daughter would enjoy making them with me for our Christmas church gathering. Thanks for sharing! these not only look terrific, i bet they taste good too! These are super cute and look easy enough for me to make! My son will love these for next year! So cute and look easy to make. These are amazingly cute and look fairly simple to make! Any kid would love these, great for school parties! aww how darlin'! and so easy - it is a perfect time to make these to keep that holiday atmosphere going! I made these with my oldest daughter and they were a big hit! Oh those are just so cute!!! Oh our little one would love those! What a fun idea! These would be great to make with my kids, we would also enjoy eating them! What's nice about these is that they're made with items that everyone should have on hand! These are so cute! Almost too cute to eat! I like that you don't have to actually cook cake balls (which never work for me) and instead just break the cake apart and form with frosting. So much easier! These are so cute! I will make them next year. So cute and clever. I really like how festive they look and they would taste good too. These are so cute! They'd be perfect for a Christmas party! Adorable!! I'm definitely going to try this. These are so creative and cute, I think a lot of people and kids would be delighted and impressed by this. Very cute! I have not had much luck with cake pops. Mine look more like a Pinterest FAIL!! But my daughter and I have fun trying! These are perfect for my daughter's class party. Those reindeer are too cute. Thanks for sharing it! These look wonderful! Would be great for the kids. These are too cute! I'm gonna save this and make them for my grandson's daycare next year! These are darling and I am sure my grandchildren would love them. Oh my, these are the most adorable cake pops! I bet they are so much fun to make! These are so cute and would be so easy to make. Those are very cute and I can see them in my Pinterest FAIL category. Oh my this are adorable! I wish I saw this earlier! Must make this next year! I'm going to give this recipe to my daughter so she can make them for the little ones. These look really cool and the kids are going to like how fun they look. These are so cute! Definitely going to try them next year! These are so adorable! I love this!